Tree roots are powerful, delicate, and often misunderstood. This blog post explores the functions, structure, and unusual relationships of root systems. Function Roots serve of variety of purposes, from absorbing water and nutrients, to storage of carbohydrates, to structural support. Generally speaking, there are two types of roots, woody and nonwoody. The primary function of the extremely thin and delicate nonwoody roots is to absorb water and nutrients. These roots are often called absorbing or feeder roots. They are characterized by small diameters and large surface areas, which make them very efficient at absorption. Woody roots are much larger and form near the base of the trunk, spreading radially outwards, decreasing in size the further they extend. The primary role of the woody roots is to provide anchorage, transport nutrients and water, as well as to store carbohydrates. See figure 1 for a diagram of tree root anatomy. Root Shape and Structure There are many misconceptions about the shape and structure of tree roots. A commonly held belief is that they mirror the tree’s canopy, but this not at all true. The growth patterns of roots depend on a variety of genetic and environmental factors. In general, however, root systems are surprisingly shallow, dominated by long, thin roots growing close the the soils surface (see figure 1). It is uncommon for roots to penetrate deeper than six feet into the ground. In fact, about 90% of roots are located in the topmost 12 inches of soil. The extent of radial root spread from the trunk is hugely variable, but when grown in the open is often two to three times the radius of the dripline (See figure 1). The dripline is defined as the outermost circumference of a tree canopy where water drips down onto the ground. Roots and fungi The roots below our feet are involved in one of the most incredible mutualistic relationships in the natural world. They partner up with fungi in a way that has huge benefits for both organisms. This relationship is called mycorrhizae. The feeder roots of the trees are penetrated and enveloped by the fungus, and a physical connection is established. This connection allows for the trading of resources, the fungus receiving sugars created through photosynthesis, and the tree getting essential minerals and water that the feeder roots couldn’t access alone. The fungal filaments, called mycelium, are so tiny and thin that they can access even the smallest soil pores, extracting resources such as phosphorus and magnesium and bringing them directly to the plant roots. 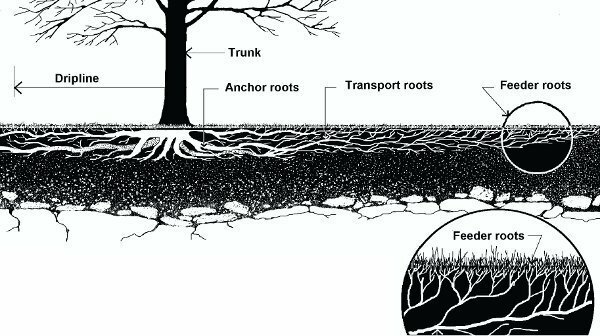 In addition to mineral resources, mycorrhizae allows trees to tap into a complex and extensive web that connects them to neighboring trees and allows for communication! Learn more about this fascinating relationship here and here. 1. Dobson, Martin. 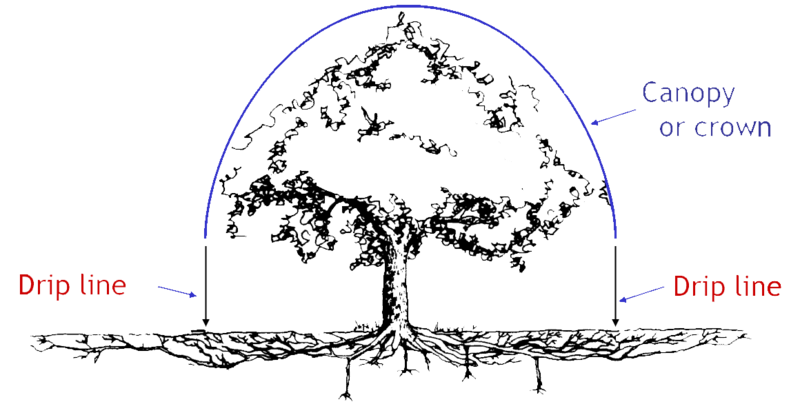 “Tree Root Systems.” Arboricultural Advisory and Information Service. Accessed July 1995. https://www.trees.org.uk/Trees.org.uk/files/61/6181f2b7-e35d-4075-832f-5e230d16aa9e.pdf. 2. “NYBG.org: Hidden Partners: Mycorrhizal Fungi and Plants.” General Bryophyte Information. Accessed July 31, 2018. http://sciweb.nybg.org/Science2/hcol/mycorrhizae.asp.html.